I just learned this week that badgers and snakes are mortal enemies and that badgers are capable of shredding even rattlesnakes. They will break into a rattlesnake trap and mutilitate every snake inside there, not to eat but simply to destroy. 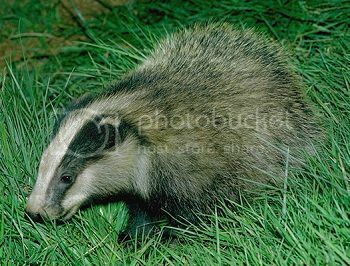 What would possess a badger to risk its life in such a way? Excessive blood alcohol? Golly, it half makes me wish we had snakes and badgers in NZ, just so I could see it, or create an experiment to test badger hormones or something. 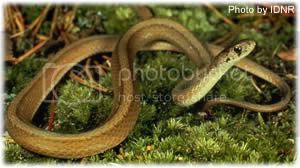 But then again, I'm happier being snake-free. According to ancient legend, turtle and badger were lovers in the begging. But then the turtle had an affair with a crocodile. The badger was jealous, so it broke the turtle shell, torn off all its legs, what it left became the snake. 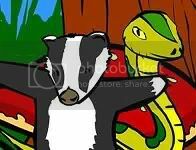 So the snake and badger had became the mortal enemies. this deminstrates the rivalry of badgers and snakes. thought that it was relivent. ......... That'sssss what you think fur face!